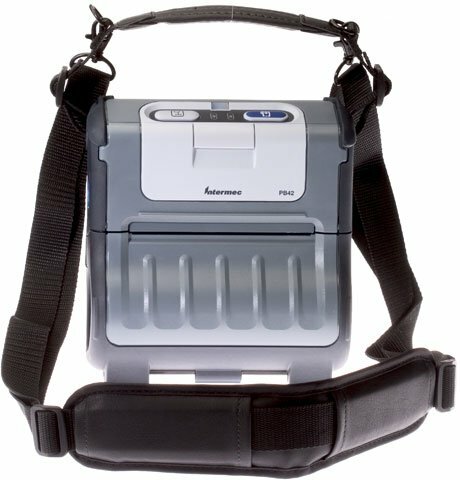 Intermec's PB42 four-inch wireless portable receipt printer is designed to improve direct store delivery (DSD), Field Service, and Home Utility applications. The PB42 printer interfaces seamlessly with the CK60 and 700 Intermec handheld computers and features easy "drop-in" charging and front loading batteries that can be changed with just one hand. Daily route activities are easily entered and tracked via a mobile computer throughout a workers shift. Receipts are immediately provided to the customer for prompt payment or to eliminate duplicated billing efforts. Shoulder Strap, Requires Hand Strap (Part# 074789), Compatible with PW50, PB42, PB2X, PB3X, PB5X Mobile Printers, Replaces Part# 074788-002. 4" x 6" Thermal transfer valeron tag. 916 tags/roll, 4 roll case. 4" x 6" Direct thermal paper label. 115 labels/roll, 16 roll case. The Intermec PB42C0B100100P is also known as Intermec Technologies	INT-PB42BX01	.